One of the exciting new products I tried at Manhattan Cocktail Classic was Sorel, a hibiscus liqueur produced by Jack from Brooklyn. I first tried it at the Gala and then at Brooklyn Day, one of the themed days of the Industry Invitational. 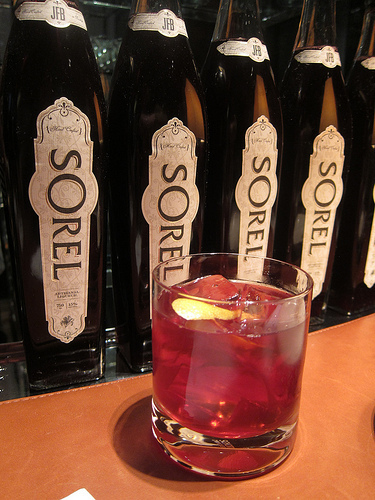 Over 15 vendors from Brooklyn came together at the Andaz 5th Avenue including Sorel. I was immediately reminded of Ribena, a black current syrup used to make drinks. Take care though not to confuse the two. Sorel is mixed with not only Nigerian ginger, Indonesian cassia and Brazilian clove, it contains 100% New York grain alcohol. It’s 15% alcohol. Guests got to try four cocktails. I tasted two including the Columbia & Congress and Flor de Fuego. The cocktails were created by bartenders from Brooklyn bars Huckleberry and Jakewalk. 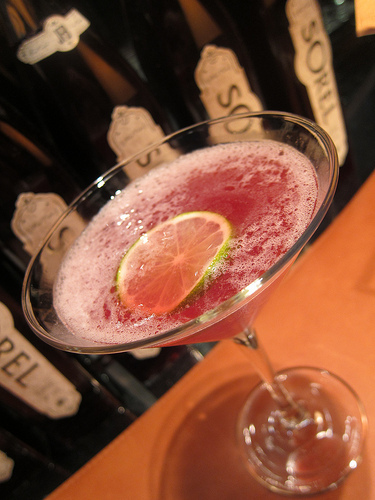 Sorel is a versatile liqueur. It could be treated as a modifier or enjoyed straight, hot or cold. I particularly liked the Flor de Fuego and liked the punch of tartness from the Columbia & Congress. Stir, strain into ice-filled rocks glass, lemon twist to garnish. Shake, strain into coupe, garnish with a lime wheel. Shake, strain into a coupe, garnish with lemon twist. Stir, strain into rocks glass, orange twist expressed (served neat with twist discarded). Later I got to try Brooklyn Gin on its own. I quite liked it and am very excited it’s coming to LA soon. I hope Sorel follows soon! I think LA bartenders would have fun using it in drinks, particularly those featuring the bounty from our local farmers’ markets. On the other hand, I could see it in classic cocktails as well. A Sorel Manhattan would be an interesting twist. This entry was posted in alcohol education, alcohol tasting, bar stories, bars, cocktail week, cocktails, events, happy hour, history, spirits, the minty, travel and tagged andaz 5th avenue, brookyln, huckleberry bar, industry invitational, jack from brooklyn, manhattan, manhattan cocktail classic, mcc, ny, nyc, sorel, the jakewalk, travel. Bookmark the permalink.